Daifuku-Anpan K.K Europain Kimuraya Co.,Ltd. Daifuku is a mochi (glutinous rice cake) with sweet red bean paste inside. EUROPAIN KIMURAYA uses tsubu-an (whole red beans cooked till they are soft) as its Daifuku filling. 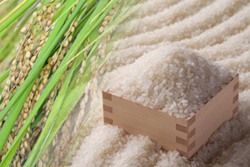 For the cake's outer thin-skinned covering, the company uses fine quality glutinous rice from Hokuriku known for its plentiful rice harvests. The tsubu-an is prepared from azuki beans grown in Hokkaido. Placed inside a specially prepared Brioche and baked in an oven, the Daifuku is transformed into a delectable Daifuku-Anpan. Established in 1927, EUROPAIN KIMURAYA created Daifuku-Anpan 30 years ago. The culinary innovation owes it origin to a visit to France by the company's second-generation owner who playfully surprised a Daifuku-loving Japanese friend in Paris with a dome bread with Daifuku hidden inside. The friend's mother had visited the company's owner and requested him to take a Daifuku to her son. Thinking of a way to carry the Japanese delicacy all the way to Europe without spoiling its soft, smooth, snow white powdery rice shell, the owner had a brainwave. He concealed the Daifuku inside a dome bread and, voila! Both the friend and the owner were joyfully surprised by the simple ingenuity of a Daifuku in the heart of a simple bread! 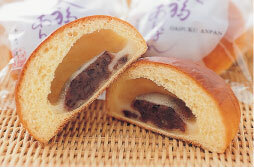 Since then, over the years, Daifuku-Anpan has acquired a following at home among some of Japan's leading artistes. You can enjoy Daifuku-Anpan straight out of its protective wrapping, savouring the thin glutinous rice covering and soft crunchy whole beans inside. Or, remove the cover and put the Daifuku-Anpan in a heat-resistant dish in a microwave oven (500 to 600 W) for 20~30 seconds which adds to the mochi (glutinous rice shell) and whole beans a delicate sweetness that dissolves in your mouth. Relish it with coffee, tea or Japanese tea. Copyright (C) 2005 - 2012 K.K Europain Kimuraya Co.,Ltd. All Rights Reserved.